Wine and curry: discuss. Historically, it’s been a confusing pairing. The usual general rule of ‘like for like’ when pairing food and wine (sweet goes with sweet, acidity goes with acidity, etc) goes out the window with curry. I have definitely made the logical decision in the past to take a heavy, spicy Malbec to Brick Lane, only to recoil at how bitter the wine tasted and opting for a beer instead. It is good to remember that it is the food that affects the taste of wine and not the wine that affects the taste of the food. Both spice and umami are enigmas to the palate, which is why you need to change your thinking when pairing wine with them. For me, saké has been a revelation – its clean, earthy, fruity, creaminess matches not only with many Japanese dishes with umami present, but everyday ingredients that have always presented pairing puzzles. Mushrooms, olives, aubergine, spinach and some earthier cheeses are all complimented by saké. But what about our beloved grapes? Are we to forego our wine when we go to an Indian restaurant? Not very likely! There are actually fantastic pairings out there, which can really make both the wine and the dishes sing – and I discover plenty of them at Kahani restaurant in Belgravia. 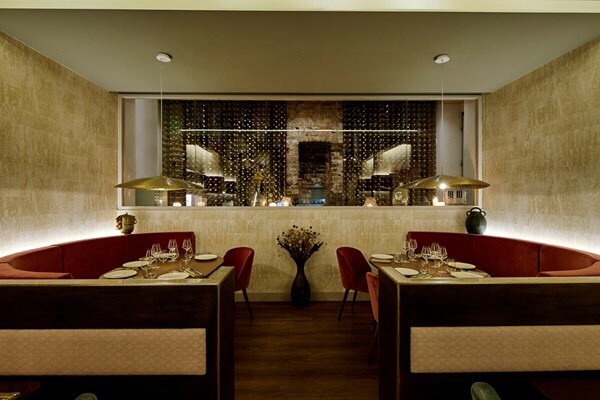 Kahani is a visually stunning restaurant at Wilbraham Place near Sloane Square, specialising in contemporary Indian fusion cuisine, which is expressed in an incredible menu by Peter Joseph. He uses fresh British seasonal produce in his dishes, brought to life by the highest quality spices from India and enjoyed in a spirited Spanish tapas-dining style. The restaurant decor is gorgeously striking, but of course, the feature that catches my eye is the wall of wine. Designed by Astrid Design and Build, hundreds of wine bottles lie horizonally behind a huge pane of glass, flanking an old stone fireplace. For wine to be such a focal point in the restaurant, it must be a defining part of the dining experience – and from glancing at the impressive wine list, it certainly seems that way. The selection on the list is extensive (there are many joyful memories to be made here!) – there must be at least thirty bottles of white, the same for red, then you’ve got four rosés, eleven sparkling, and a range of sweet and fortified wines. There is also a Coravin selection for 125ml measures of fine wines, which is a nice way to try something special. I’m happy to see a saké section too – they know their onions here! I want to try a couple of different glasses and I start with the Little Beauty Dry Riesling (Marlborough, New Zealand). Bright and crisp, it feels bracing on the palate, readying the tastebuds for the next wave of flavour from the vibrant dishes. Whereas spice can make wines seem thin, the slightly oily texture of this wine allows it to retain its body when combined with the food. The Riesling-petrol notes kind of do what saké does, which is to give a sweet, overripe fruitiness – and fruit is a great match for heat. Even more fruity is the Mount Brown Sauvignon Blanc – an explosion of citrus and tropical (certainly grapefruit and passionfruit) appeals to the exotic flavours and also cuts through any scrumptious fattiness. This wine possesses quite a mineral edge too, complimenting any umami in the dishes. I try the Vermentino (Unmaredivino, “Blanco Smeraldo” Vermentino di Gallura Superiore), which I knew would be a delicous wine, but I wasn’t sure how it would pair with the food. From sunny Sardinia, it is intensely aromatic and is brimming with apples and limes – perfect with the sweet spices and chutneys. This turns out to be one of my favourite pairings of the night. The white wines go down a storm and I am convinced that wine and Indian food can gallop off into to the sunset together and live happily every after. But what about red wine? Just because I spot it by the glass, and just because I crave a red, I order a glass of Crozes-Hermitages (Domaine M. Chapoutier, “Les Meysonniers”). Trés enjoyable regardless of pairing, but it happens to go very nicely with the venison keema as it’s all forest fruits and earth. Deer are from the forest, as are truffles (it tastes gorgeous with the truffle naan) – perhaps I am finding my ‘like for like’ in wine and Indian cuisine, after all? There’s a commendable range of red wines by the glass and, with a Côte du Rhone, a Malbec, a Rioja, a Bordeaux and a Californian Pinot Noir, there is something for all red wine lovers. But do they pair with curry? Well, as there is such a variety of styles, Ennio is confident that you will find your perfect pairings in there. Much of the meat is chargrilled on the robata grill, which cries out for a juicy, smoky red – and you’ll find it in this list. One thing to note is that many of the dishes at Kahani aren’t fiery hot – and if you like your food that way, one tip would be not to add extra heat with a spicy wine; something light and sparkling would do the trick. I think fruit is key when pairing with spice – that’s why a Gewürztraminer always works well with curry or a Late Harvest Tokaj or an off-dry Riesling. That would explain why the fruity and aromatic Sardinian Vermentino was such a hit with much of this menu. So much of Peter’s food is garden-fresh and vibrant and so the dry, crisp Riesling was a great match with our light starters. Looking for matches with the different elements of the dishes is a good place to start. Is the sauce tomato-based, mushroom-based, cream-based or onion-based? Is the meat red or white? Is it chargrilled or slow-cooked? Is it a light dish or a rich dish? Just like the bevy of varied, intricate dishes at Kahani, one curry isn’t the same as the next curry – they all possess different flavours and characteristics – so there must be a whole range of wines to suit them. Still confused? Kahani have invested in a fantastic sommelier for good reason – just ask Ennio!